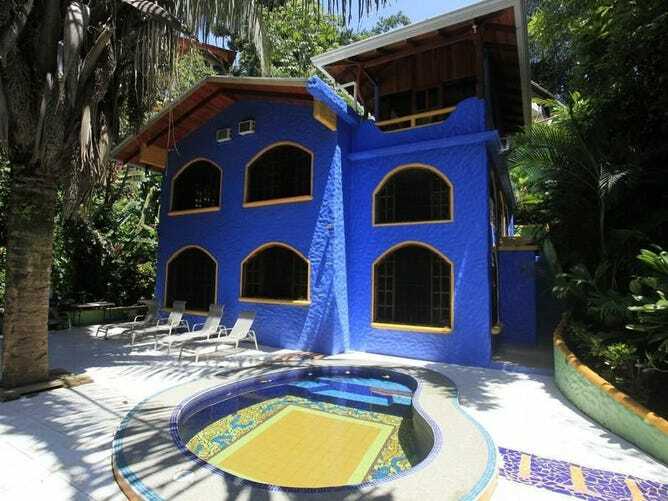 Details:- Casa Mono Titi is quite simply the best deal on a 4 bedroom, ocean view vacation rental property anywhere in the Manuel Antonio area. Located on a private cul de sac in the secure community on Pacific Canyon Drive, this eclectic tropical home provides seclusion, views and a rain-forest setting which is difficult to match. Your arrival to the home is via a descending staircase surrounded by tropical gardens which lead you into the home. The common area, which is on the ground level of the home has a fully equipped kitchen and spacious dining area complete with a stunning tropical hardwood table. There is an enormous tropical deck that surrounds the pool which is ideal for lounging, gazing at the ocean or marveling at all the wildlife including daily visits from the Mono Titi\'s a rare species which can only be found here in the Manuel Antonio area and which thrives in the jungle setting around this property.